FileCOPA takes the hard work out of running an FTP Server. The FileCOPA FTP Server installs on any version of the Microsoft Windows operating system with just a few clicks of the mouse and automatically configures itself for anonymous operation. Award winning FileCOPA FTP Server is ideal for business users who require a powerful and flexible FTP Server. 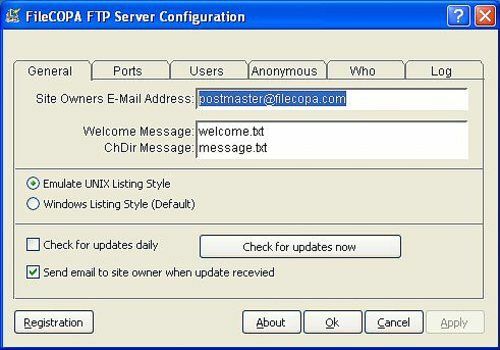 FileCOPA's features include full passive FTP support, and unlimited connections.